Elliot Shebek celebrates a home run during the 2016 season. Shebek spent the entire fall semester rehabbing a spinal disorder. Photo curtesy of Shebek. Elliot Shebek woke up in the middle of the night last April with a pain down the left side of his body. What started as a sharp pain quickly got worse when he lost all feeling in the left side of his body, which left him motionless in bed. The pain worsened by the second and normal bodily function became more difficult. He couldn’t walk, stand, or even speak correctly. His right leg, the leg he still had feeling of, began to spasm out of control. “Something was horribly wrong,” Shebek said. Shebek, the DePauw baseball 2018 opening day starter in left field, may never get to play baseball like he did before. A back injury after the 15th game of the year ended his season last year. What started as a standard injury got worse by the day until Shebek found himself confined to a wheelchair at Mayo Clinic in Rochester, Minnesota for the entirety of his first semester of his senior year. 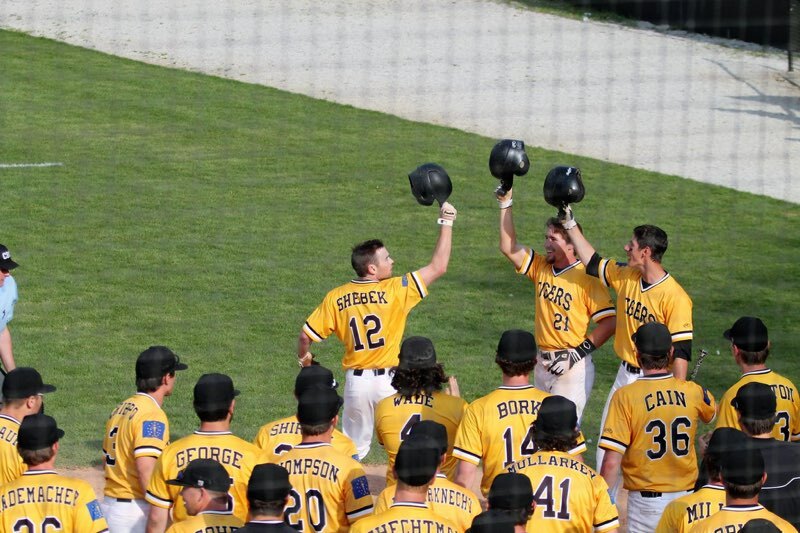 Elliot Shebek came to DePauw in the fall of 2015 from Carmel, IN, recruited as a utility player who could be plugged to play at multiple positions. Shebek quickly worked his way up the depth chart, and found a spot as the first outfielder off the bench during his sophomore year, a year in which very few underclassmen had consistent roles on the team. He finished the year batting .321 with one HR, 12 RBIs and four stolen bases. 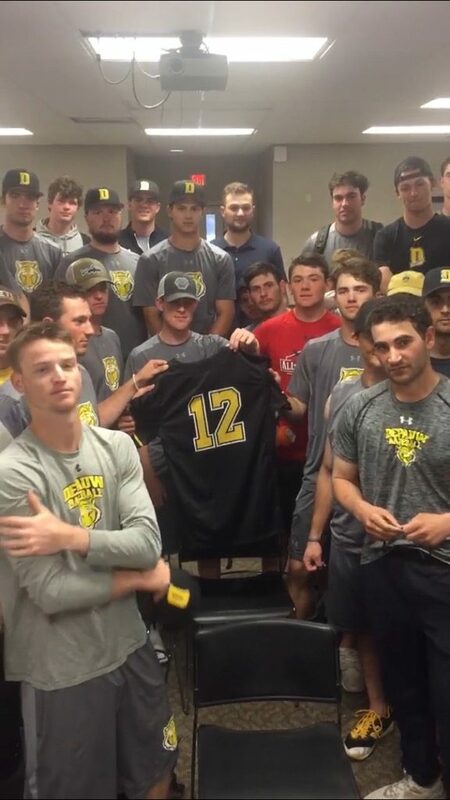 The DePauw baseball team poses for a picture with Elliot Shebek’s jersey to show support. Photo curtesy of Shebek. “He was kind of our unsung hero that year,” head coach Blake Allen said. Shebek saw an opportunity that offseason with two of the three starting outfielders leaving for graduation. He worked on his craft and was named the starting left fielder for his junior campaign. Then, he started to feel it. Shebek can’t quite describe the feeling. He didn’t hear a pop like a knee injury and there wasn’t any swelling like a broken bone. Just a nagging pain in his spine. At first, he only felt it when he took a harder than normal swing of the bat, but it got worse. Soon, he spent entire nights curled up in pain. “I’ve had back problems for the majority of my life, but this was different,” Shebek said. The trainers quickly shut him down for the season, and then the night happened when he lost feeling. Shebek went to see specialists, took MRIs, X-Rays and cat scans. As the pain got worse, the specialists were more confused. Every possible diagnosis was quickly shot down and it seemed as if Shebek left every meeting with more questions than answers. Lou Gehrig’s Disease, Lupus, and Benign Rolandic Epilepsy were all thrown out as possible diagnoses, but they were all shut down. 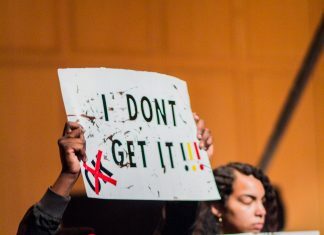 “It basically came down to them saying, ‘we don’t know,’” he said. Eventually, he could not walk without a wheelchair or walker. Mayo Clinic is a medical center based out of Rochester, Minnesota that focuses on research and clinical trial studies for people in need of physical therapy. The rehab and treatment is excruciating for someone in the position of Elliot Shebek. Shebek was tired of not walking and decided he was going to do whatever it took to get on his feet, so his parents made the call to Mayo Clinic and got him set up at their headquarters. Mayo Clinic identified Shebek’s condition as a damaged cerebellum and amygdala, which causes the brain to not communicate correctly with the spine. “Every doctor I saw before Mayo would say, ‘let’s see if we can fix this.’ Mayo told me, ‘we are going to fix this,’” he said. While his fellow teammates and classmates celebrated their final fall semester of college, Shebek was in Rochester rehabbing his injury. Every morning was a different challenge. Each step a mini-victory on the road to recovery. “It would take me 10 minutes just to walk 15 yards,” Shebek said. The focus was on repetition and rewiring his brain to remember how to use his muscles. The doctors would have him walk, and if there was the slightest mistake in a step, they made him start over. He knew there was a chance he would never get to play baseball again, but the sport was his best avenue to recovery. The physical therapy drills were all baseball related. Fielding tennis balls to improve his strength and balance. Soft swings of the bat to increase his flexibility. Shebek kept in contact with his teammates and coach on a daily basis, exchanging videos of his progress with videos of the team practicing. Every step Shebek took in the right direction gave the team more motivation during fall practices. “How can someone go through the kind of mental and physical struggle Elliot did, and yet still not make it about himself and stay as positive as he did? He is our leader and an inspiration to us all,” Allen said. Tyler Holt, a 2018 DePauw baseball graduate, stayed particularly close to Shebek during the process. Holt said that despite having all the odds stacked against him, Shebek still found a way to love other people during the toughest time of his life. Shebek would get on social media every night and see his friends enjoying the semester at DePauw. Part of him wanted to give up. Throw in the towel. Say no to the gut wrenching workouts and the bleakness of using every bit of strength in his body to take a single step. But one thing kept him motivated. “I needed to walk again,” he said. Standing for an extended period of time on his own turned into small steps. Small steps turned into slow jogs. Slow jogs turned into sprints. Now, Shebek can do just about anything. He even boxes to improve his strength and agility. “I write down on a piece of paper every day, ‘I can walk again.’ And that makes me more proud than anything,” he said. Shebek wants to play baseball again, even if it’s one at bat or one swing in a game. He is willing to take on any role the team needs him to have. Whether it’s a coaching role, manager, or just an extra set of hands to toss batting practice, he wants to help.